I make a big deal about freshness when it comes to enjoying my beers. This is mostly because the hop flavors I enjoy most are the most fleeting. Beers don’t exactly go bad but there is a certain window in which those delicious citrus, floral, pine, and tropical fruit flavors dominate a good hoppy beer. In some ways, this is why small breweries have been so successful. They rarely have the capacity to brew giant batches of beer that are going to sit on the shelves for 3 months before anyone drinks them. At some of the smallest breweries, they are lucky if an IPA sticks around for a month before that batch is depleted. In this post I am going to explain why fresh beer is important for those who have a refined palate and some ways breweries could sell more beer to those like myself seeking freshness. I named this blog “San Diego Hop Addict” because I am addicted to hops when it comes to my beers. At first I thought it was a simple enough task to look on a menu at the restaurant for those three letters, IPA, and I would be satisfied. Then over time I started to drink certain varieties of beer I thought were great originally but for some reason didn’t taste like the same great beer I had before. What had once been a beer dominated by flavors of floral and citrus was now largely a syrupy drink with the sweetness of malts. But wasn’t this the same beer I had when I first opened the 24-pk? It took me swearing off some of the most popular IPAs before I realized it was not a lack of quality control but a lack of freshness. Stone Brewing admittedly has had enjoy by dates on their cases of beer for some time but I ignored them at first thinking that beer is beer and there is no way it could go bad. To many people this won’t even register as a problem. If you are already a fan of IPAs that tend towards the darker side, and thus focus on malt flavors, a Stone IPA that has lost its hop bite will still taste great to you. I take one taste of those malts and sigh. Though the beer is not horrible, I could be enjoying something closer to the style that got me excited about beer in the first place. If your ideal beer is Societe’s Apprentice or Ballast Point’s Sculpin, freshness is hugely important in shaping the flavor of each beer you pour at home. There are a few reasons why it is in the interest of a brewery to make a big deal about freshness. Fresh IPA is much more likely to impress someone with some intense flavors that leave a lasting impression. When an IPA is not very fresh, consumers may write it off as a poor IPA rather than recognizing that it is not as fresh. In short, making a clear indicator of freshness helps ensure that consumers recognize all the quality control put into a product. There are a few ways that brewers can ensure that consumers taste fresh beer more often than not. 1) Brewers can produce smaller batches of the big hoppy beers. This can be a way to make sure that a year-round product consistently tastes fresh. 2) If smaller batches are not used, bottled-on dates or clearly-explained enjoy-by dates should be used. 3) Seasonal releases can be used to give consumers a clear idea when the beer was released. This is one way a smaller brewery has an advantage over a bigger brewery. They are not brewing a ton of beer to distribute nationwide so it is more likely that each batch will be fairly small. I know when Intergalactic Brewing puts out an IPA that it is going to be around for a few months tops before that batch is sold out. This means that the beer I drink at the brewery is more likely to be fresh. With breweries that don’t sell bottles, this helps to bring consumers back to the tasting room to either enjoy beer there or buy a growler to take home and share. I make a note to visit Intergalactic Brewing as soon as they put out a new batch of the Perseus IPA because it is amazing when it is fresh. Enjoy-by dates are an interesting beast because there doesn’t seem to be a clear agreement as to how far out the date should be from the release of the beer. Thus, a bottle of Palate Wrecker from Green Flash that says “Enjoy By July 2014” doesn’t tell me if it was bottled just this past month or back in January. A simple explanation on the bottle indicating how this date is calculated would be able to tell me through inference when the beer was brewed. It could for example say “our enjoy-by dates are set 5 months out from bottling.” Though even better would be if beers had a clear bottled-on date printed on the bottle. Then when I am in the store looking at a 6-pk of Sierra Nevada Pale Ale I can tell how fresh it is much easier. I suspect that breweries don’t use enjoy-by dates to avoid scaring off the general consumer who might avoid a beer that was bottled five months ago without that date. I would certainly always reach for the beer that was most recently bottled in a market where there are so many quality IPAs to choose from. I think if breweries included an explanation with the bottled-on date so that the consumer knows what to expect from reading it, this wouldn’t result in a significant drop in sales. I also don’t expect the average consumer would notice the date or care without some explanation on the packaging of what a difference freshness makes. Thus, breweries could also educate consumers better by putting some explanation on the bottles or an infographic on their social media pages. Seasonal brews are useful in many of the same ways that small batches are useful. The benefit of a seasonal from the perspective of the consumer is there is typically a big announcement of the beer’s release on the breweries’ Facebook page, giving you a clear idea when it was released. Alesmith, for example, has two seasonal beers called Yulesmith. One is released in the summer and the other is released in the winter. Fans familiar with this release schedule will know that when a Summer Yulesmith shows up in the store it is going to be very fresh. This push to enjoy these beers fresh helps the brewery sell that small batch of beers quickly so that everyone who drinks it has the same experience of flavors. Russian River does essentially the same thing by ensuring that Pliny the Younger, the legendary Triple IPA, is shipped fresh and served quickly. This means that the only time someone will drink a Pliny the Younger is fresh and on tap, giving it a delicious flavor every time. Though brilliant, I prefer the approach of Stone with the Enjoy By because this means I can enjoy it at home and don’t have to wait in line for an hour or more to try it. Keep in mind that this whole discussion is largely limited to a small portion of the beer industry, beers with intense hop flavors up front. Different styles of beers age much nicer and still taste great six months after bottling, if not longer. I will even enjoy an older IPA if the malts are of a variety I enjoy. This is why in general moving towards an enjoy-by date system more similar to what Stone uses would be best. 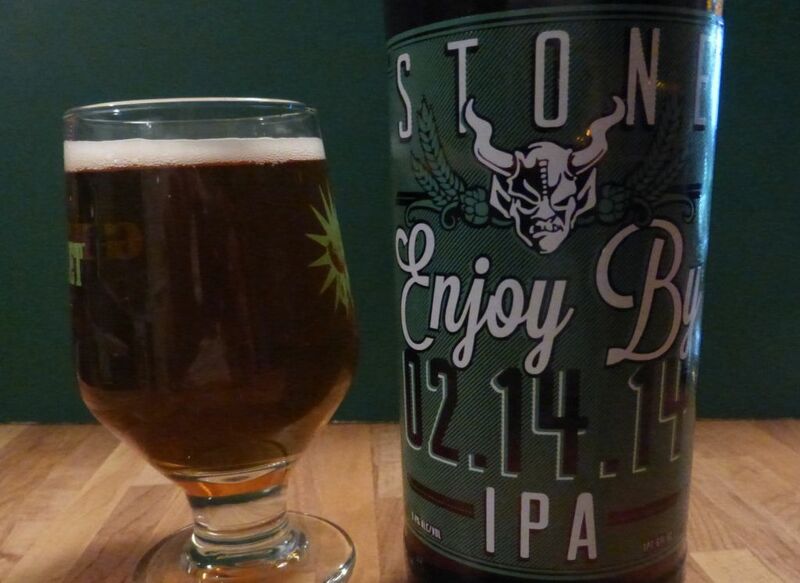 Stone started to put enjoy-by dates much closer to bottling so that the enjoy-by date of a Go To IPA is 2 months after bottling. The important thing at the end of the day is enjoying the beers that you drink. Drinking for the experience of the unique flavors of a beer is more likely to satisfy you with a few beers. This can also avoid drinking heavily for the sake of getting wasted, which is disrespectful to yourself and to the quality of the beer.